An energy-efficient and quiet cooling system equipped with a chilled water station and room-specific coil units. The housing company Turun Tyyrpuuri’s elegant copper facade greets visitors arriving to Turku over the sea. All the flats in the building boast a handsome glazed balcony facing either southwest or towards the river, while the larger flats also have a covered terrace. In summer, the flats with large windows that make the most of the stunning scenery are kept pleasantly cool by Grand fan coil units. The south-facing flats catch direct sunlight throughout the day. 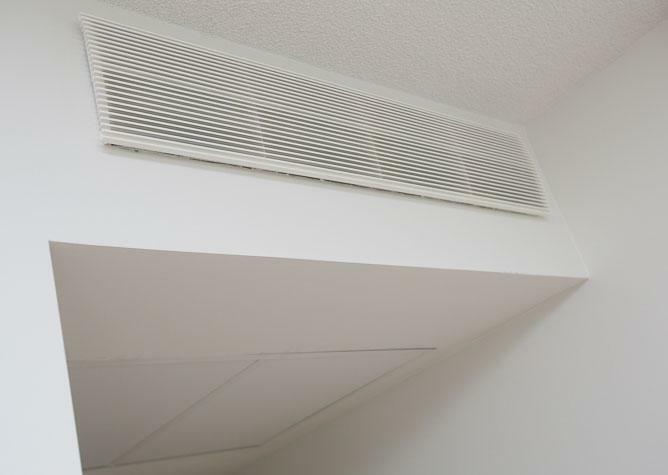 ‘In summer, they would get uncomfortably hot without the cooling feature integrated into the ventilation system,’ says SRV Construction’s Construction Manager Pirjo Kujala, who explains that buyers today are aware of the requirements for good indoor air. She says that a ventilation system with a cooling option is rapidly becoming a must in new flats and houses. High-quality housing must offer pleasant indoor conditions all year round. According to HVAC Design Engineer Petri Vuorela, the properties that swayed the decision in Chiller’s favour were the silent operation of the Grand fan coil units, the small space required by the system and the cooling device’s ready-assembled design. Because having silent ventilation and cooling system at the property was important to the developers, they opted for the Grand fan coils, which were originally designed and developed for use in hotel rooms. The device’s silent operations are the result of its air-tight structure and high-quality components. Pirjo Kujala explains that energy-efficiency is another feature that is essential in cooling systems for residential use. The Grand fan coil hit the mark in this regard as well. The coil unit is not only silent and energy-efficient, but also of high quality and easy to install and clean. Because of these qualities, around 200 Grand fan coil units were installed in the housing in Telakkaranta. Even during the hottest days of the summer, the indoor temperatures in the 130 m² flats remained at a very pleasant 25 degrees. The housing company also benefits financially from having its own chilled water station, which works out considerably cheaper than using district cooling. SRV signed a Service Next maintenance agreement for the Tyyrpuuri housing because it ensures carefree and cost-efficient maintenance services. When a device suffers a fault, the cause of it can be checked via the remote monitoring system without the need to dispatch a maintenance team to the location. Often the remote connection can also be used to rectify the situation, which reduces maintenance costs.